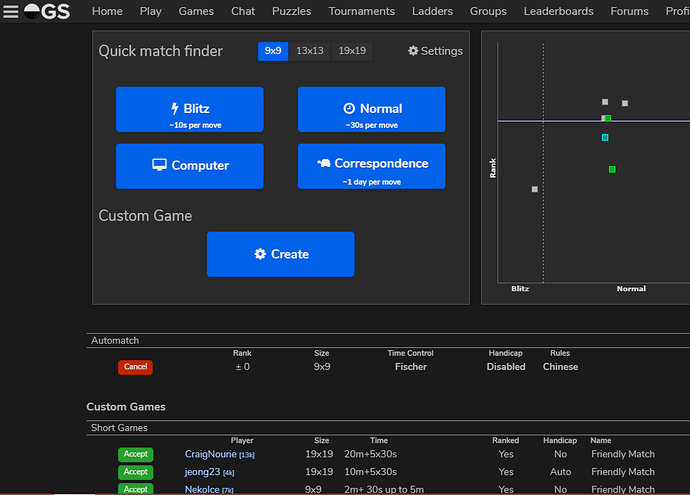 Quick Match Finder UI. Is this a bug / suboptimal / fine as is? For someone unfamiliar with the site it may be counter-intuitive. It is easy to quickly learn to ignore the endlessly changing blur of game information below the QMF panel. Anyone using a small screen device may also never see the red ‘cancel’ button. So what do the rest of you think? Is this a bug? I don’t know how it compares to UI standards out there. If it’s not a bug, is it worth fixing anyway? As it is now, it may result in the creation of ‘junk’ games diminishing people’s OGS experience. Especially their first impression. [Edit] You could add a ‘Never show me this message again’ option to it perhaps. That’s certainly a change that can be front end only. I’ve never been wild about how that works myself. I think your suggestion is an improvement. The title of that section with the red button could be improved too. This might be nice toe in the water for someone wanting to get started with OGS client programming. Is there a place to make feature suggestions or to bring something like this up, regarding the open source front end work being done on OGS? Yeah, some visual clue would certainly be nice. 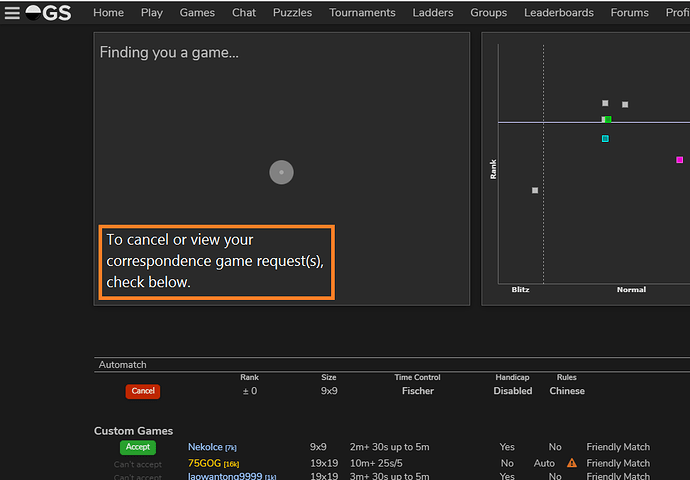 Maybe if the correspondence button itself had a variable of X pending games? or after clicking the correspondence button the button text itself changed for a moment? that should be simple and clear, no? My experience is that when you submit a correctly coded front end patch (using the ‘_’ translate operator) anoek arranges for the translation in due course. At the moment “what is the best place to suggest front end stuff” is not well defined as far as I know. I use github to suggest backend things, and evidence is that this gets looked at by anoek (the person who can do backend things). However, there isn’t a coordinated pool of requests and front end developers doing them. For the most part, front end developers tend to do the things they are self-motivated to do Either because they themselves want them, or I guess if they read them here and got inspired. @GreenAsJade, if you build it, they will come . Perhaps a thread where users could add such requests could be made. I doubt it is within your control, but a link to this somewhere on GitHub would bring it full circle . It might be the case that if you put together yet another system of suggesting stuff, which filtered out back end stuff and prioritised front end stuff, then front end volunteer developers might pick those up. But actually most front end developers do OGS client development because they want to implement their priority - that’s what got them motivated to do the work in the first place. Upon reflection, I do think that github is probably the place to put ideas/requests in the hopes that front end developers might do them. On the rare occassion that there is a prospective developer looking at OGS front end and wondering “what shall I do to make a start”, github is certainly the place they would look. Sent a PR for this https://github.com/online-go/online-go.com/pull/763, using the OP’s suggestions. Would welcome any feedback! Getting some notification that you just made an automatch challenge thats waiting for opponent would allow some more freeway for cancelling the unwanted accidents before the game even starts, but half of the time those accidental clicks do start the new game immediately, since there is already a challenge waiting by the other player. Its not that big of a problem, i think only something like 1-3 corr games i’ve ever created by automatch have been accidents resulting to games being cancelled by my opponent as they started. ps. 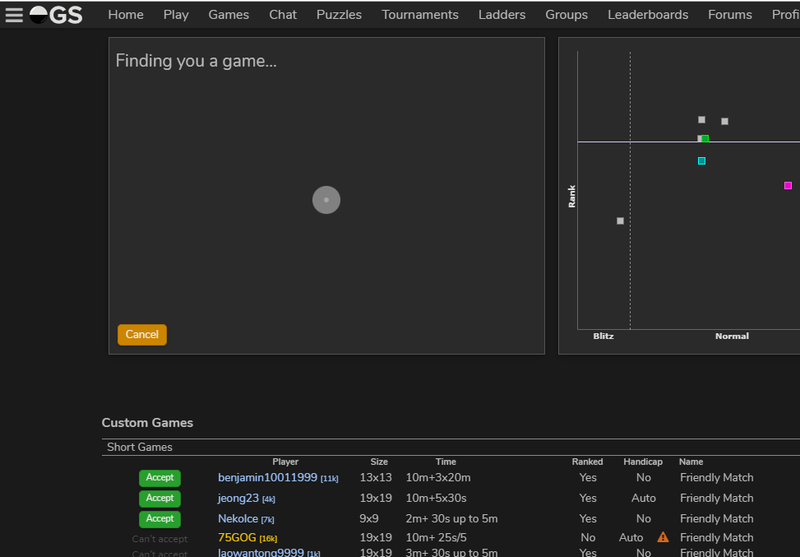 maybe like 5 second ‘lag’ before correspondence automatch challenge goes into system would be a good thing, or at least it wouldn’t do any harm, since 5 extra seconds for a game that lasts months doesn’t really matter in one way or another.